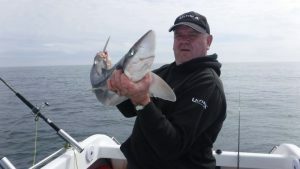 There are Tope being caught in Numbers in Luce Bay and Wigtown Bay as well as Smoothhounds ,Bullhuss,and Thornback Rays. 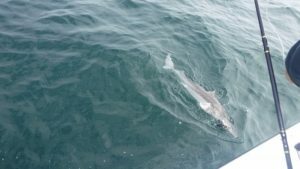 The Mackerel are still not showing in large shoals but there are enough about to get a few Baits for the Tope and other species. 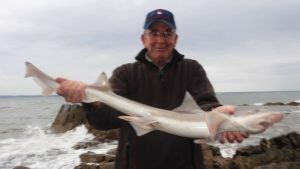 There are a few Bass about as well as Gurnards ,Small Whiting ,Codling etc and the Boats out from Portlogan and Portpatrick have been getting a few Pollack,Haddock,Spurdog ,Bullhuss etc, From the Rock marks there has been a good lot of Tope landed as well as Smoothhounds and Thornback Rays,also Flounder ,Plaice ,Dabs and Dogfish. 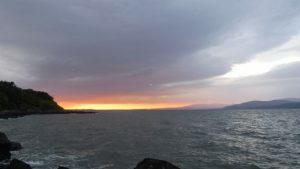 I Fished Wigtown Bay with a friend last week and we had Small Tope,Smoothhounds,Dogfish and one small Thornback Ray, also last Saturday Eveng I filled my Boat Reels up with 50lb Ultima PowerBraid,made a few Tope Rigs and then selected a couple of Rods that I had not used for a while ,a Daiwa Whisker Kevlar 12lb Class and a Graphite Coil 20-30lb class for my Trip to the Isle of Whithorn the next day. It seemed to be a very short sleep until the alarm woke me at 5.00 am ,so quick Coffee,pack the Motor and the it was time to head off and meet Campbell Hearton with his Warrior 175 for our depature from the Isle of Whithorn. 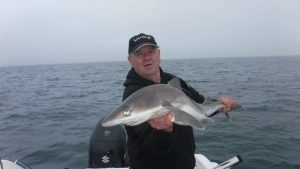 After an early Launch just after 6,30 am we headed out to try and find a few Mackerel for Bait,and it was not long before we had achieved this and made offshore to get the hook down and try for a few Tope and anything else that fancied a chew at our Baits. About 15mins after the first Bait hit bottom Campbell had an enquiry,which the ran off with the bait, he duly set the hook and soon after we were looking at a nice Tope of about the 25lbs size,my turn next but my one was a little bit smaller about 9lbs, nice to see these small Fish for the future years. 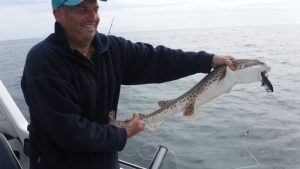 After a few more Fish I landed one about the 25lbs ,and shortly after reeled a Bullhuss of about 15lbs to the surface which duly spat out the bait and headed of back to the bottom . 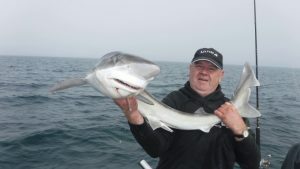 The fish kept coming fast , lots of good Spurdog up to about 16lbs and then another Bullhuss which performed the same trick as the last one, I thought to myself they must be camera shy. 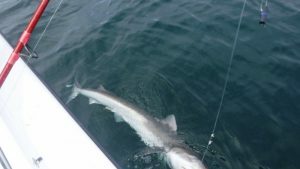 The Spurdogs kept coming as quick as we could get Baits down ,so we decided on a move to a Mark a bit closer in where there was less tide and we might escape the Spurs and get a few more Tope. 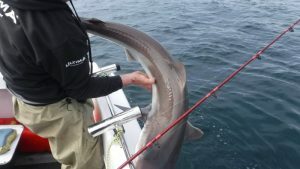 After reaching the Mark it wasn,t long before we got some Baits on the bottom and soon after we got the First Tope,then another and it carried on until it was time to head Home ,another fantastic day afloat in good company.